Hotel Director Gary Davies talks about changes to the ship. Gary Davies was one of the officers who brought Adventure of the Seas into service in 2001. 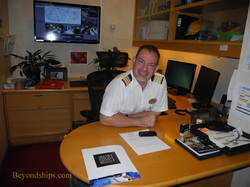 Since then he has worked on several other Royal Caribbean ships and at the corporate headquarters. He returned to the ship as hotel director in 2014. This is not to say that Adventure has remained static or failed to evolve. Indeed, as will be discussed below, the ship has recently had some significant changes and will be having more in the not too distant future. Rather, despite these physical changes, Adventure remains true to the Royal Caribbean cruise concept. In April 2014, Adventure underwent a nine-day drydock. New electronic chart displays were installed on the bridge. The hull was sandblasted and coated with a new paint designed to allow the ship to slip through the water more easily, thus making her more fuel efficient. A problem with one of the propulsion pods was addressed and that pod given new bearings. More changes are to come in 2016. 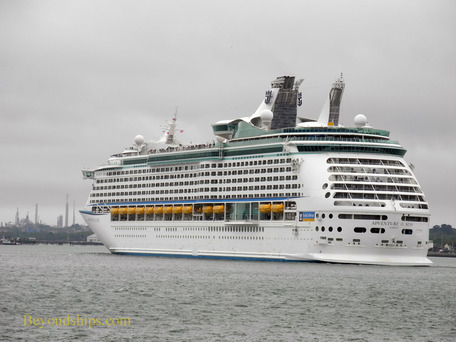 Royal Caribbean is undertaking a program called the Royal Advantage in order to bring some of the features introduced on Oasis of the Seas and Allure of the Seas to the rest of the Royal Caribbean fleet. These revitalizations require taking a ship out of service for a month and so the line is gradually working its way through the fleet. Thus, the evolution of Adventure of the Seas continues. The captain, hotel director and guest services manager tell what Adventure of the Seas is all about.